One of the Pearl District’s best features is the ease with which one can lead a carless lifestyle, but how do visitors understand this? It can be tough, especially for those who never ride public transportation. There’s a number of options: the Portland Streetcar, TriMet (bus lines 77, 8, and 22 serve the Pearl District), and car sharing programs. Getting around the Pearl District without a car has never been easier, but, with anything, there are always pros and cons. The Portland Streetcar has been a huge success, ever since the redevelopment of the Pearl District. Coming from downtown, the Streetcar travels north down 10th avenue, and the south down 11th avenue. While it’s easy to remember 10th and 11th avenues as the Streetcar’s main routes, the route turns wonky after you pass Lovejoy heading north. The line goes two ways at this point: either to the NW Portland neighborhoods, or over the Broadway Bridge to the East Side Loop. Though currently two independent routes, there have been plans to make the lines connect as a singular loop in the future. The East Side Loop passes by the Rose Garden & Memorial Colosseum, winds through the Lloyd District, and ends at OMSI. North of Lovejoy leads to the cozy shopping boutiques along NW 23rd Avenue, and is a much shorter round trip. Fare for the Streetcar is required at all times, and can be purchased at station platforms with cash or card. TriMet’s Line 77 is the most direct bus line to the Pearl District. Although there’s only one bus line through the Pearl District, there is surrounding area lines. The number 8 is close in Old Town, and the number 22 travels on Burnside. In the Pearl District, the line mostly runs down Everett and Glisan streets. TriMet fare can be purchased on the bus with cash or coins only. One of the newest, most time-efficient ways to get around the Pearl District is through one of several new car-share programs. 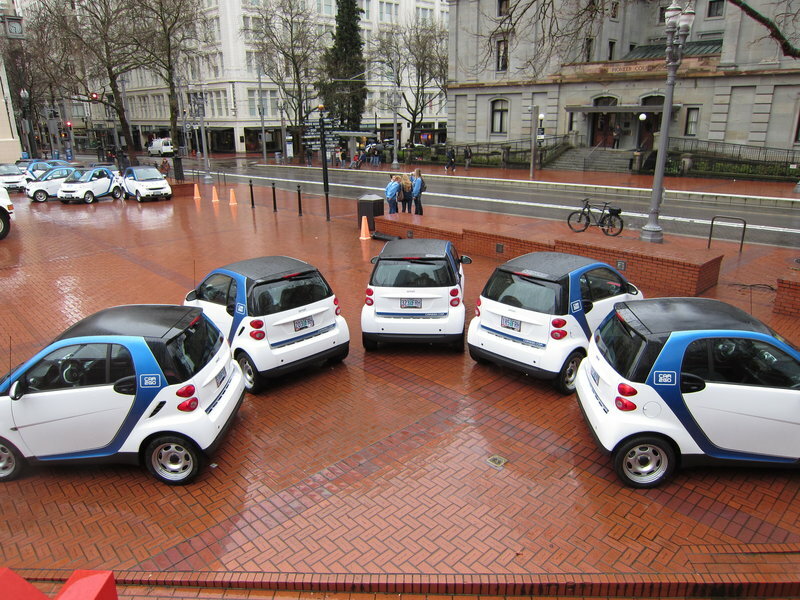 There’s two large companies in Portland offering car sharing: Car2Go and Zipcar. They both require a prearranged membership before renting; drivers must pass a driving record background check. Both rental agencies have been criticized in the past for steep requirements, but once you get through all those processes, it’s as easy as swiping your membership card and jumping in the car! Both agencies rent by the hour or day. Corporate discounts are often available, so check with your employer for more details. Zipcar places their vehicles in special permit spots, and Car2Go is permitted to park in any legal parking spot. Now that you know how to get around the Pearl District, where will you go? Check out our comprehensive guides to shopping, dining, and more. Questions? Include them in the comments below or contact us.